Use this simple formula to build a one-page business plan and jump start your business planning process. Download our free one-page Lean Plan template to get started. If you’ve been putting off writing your business plan, you’re not alone. Writing a business plan can seem like a daunting task, and lots of entrepreneurs avoid it for this reason. But it doesn’t have to be. An easy way to start is with just one page. There’s really not a lot of difference between a “one-page business plan” a Lean Plan, and a good executive summary. The only real possible difference is the that the “one-page plan” must absolutely fit on one page in a font that most people can still read. A Lean Plan can be slightly longer but still uses summaries and bullet points, while traditional executive summary can extend to two or three pages—and it will usually use full sentences rather than bullets. Investors don’t have lots of time to read and one page can get the idea of your business across quickly and succinctly. It’s actually a very good exercise to trim it down to the absolute minimum—it forces you to trim needless words and communicate your business idea clearly, with minimal clutter. Here at Bplans, we’ve developed a formula that helps you quickly put together all the critical information that you need to define the strategy for your business. Some people like to call this your “business model canvas,” but it’s really the same thing. If you feel like you have writer’s block, or you don’t know where to start, I have a couple of suggestions. First, you can start with a detailed, step-by-step set of instructions for building your one-page business plan. You’ll be able to do it in under an hour. Second, you can download our free one-page business plan template and use that as a starting point. 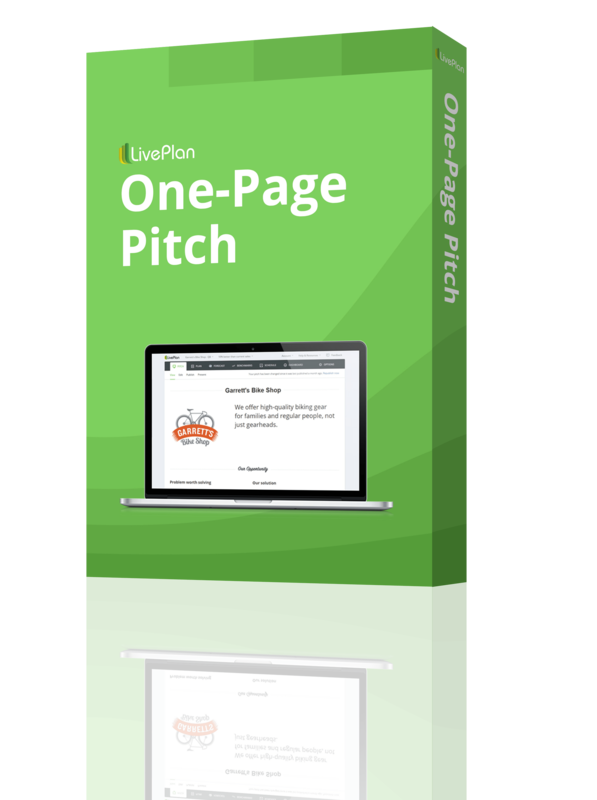 Third, you can try out LivePlan’s Pitch feature. Just answer the questions it asks and click “publish,” and you’ll have a professionally-designed, one-page business plan that is easy to share and covers everything an investor wants to know. Another good option is to follow my colleague Caroline Cummings’ advice and write your business plan like it’s a series of tweets (seriously, it works). The content of your plan is by far the most important thing—don’t stress about the design. Think carefully about what you are trying to communicate. Too many companies spend time focusing on presentation and graphical display of their plans when what they are saying and how they are saying it is really the most critical aspect of it all. Don’t get me wrong—you don’t want to have an ugly presentation. But focus on the content, because it’s more important than anything else. Remember: The executive summary (or Lean Plan, or a one-page business plan) is usually your introductory communication with investors, so it will be your first impression. Investors will use this document to get an understanding of your communication skills as well as your ability to think critically about your business. You should spend more time on this part of your plan than on any other section. Your one-page plan will be an extremely useful tool to help you refine your business strategy quickly and easily. It might even be all the business plan that you need. But, if you do need to expand your one-page business plan into a more full-fledged plan that includes more details on your company and your target market, you can follow our step-by-step guide for writing a detailed business plan, download our free business plan template, or review any of our more than 500 complete sample business plans. These resources are all free, and if you have questions, please reach out on Twitter @Bplans. Editor’s note: This article was originally published in June 2012, and was updated in July 2018.